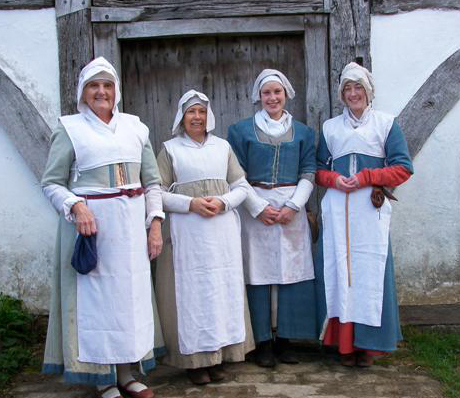 Replica Tudor clothing is made by the Needlework Group at The Weald & Downland Open Air Museum to be worn by interpreters and demonstrators in Bayleaf Farmstead. The clothing is as historically accurate as possible to the status of a yeoman family of the 1540s. 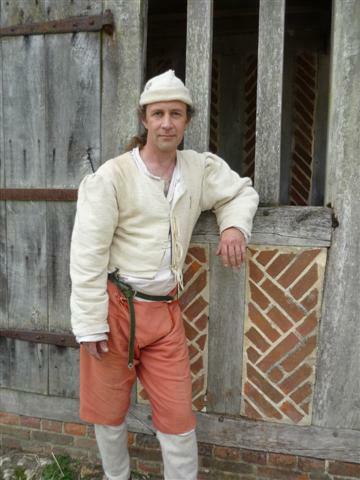 The clothing is made in durable replica fabrics, wool and linen, naturally dyed and totally hand sewn using the correct techniques of the period. Laces, points and braiding are also all made by the group. The shoes and accessories are as hard wearing and as historically accurate as the clothing. 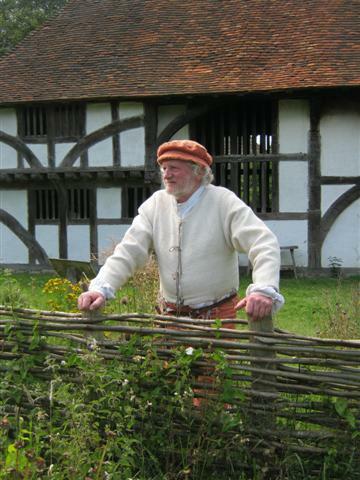 The clothing style, colour and fabrics were to be specific to the Weald & Downland region as possible. Initially the project was funded by the Friends of the Museum to provide outfits for those taking part in daily domestic interpretation. A complete woman’s outfit consists of a linen smock; a pair of bodies; woollen kirtle with detachable sleeves; woollen gown; linen neckcloth, partlett, overleeves, fillet band, coif and apron; a pair of hose and garters; hand-made leather shoes. Smock: The item worn next to your skin, it would have been made of linen. Kirtle: Made of wool, lined with linen. Detachable sleeves. Can be worn as an extra layer under a gown but never worn just be itself. Stomacher: A stomacher was a panel, often decorated for wealthier women, that filled in the front opening of a woman’s gown or bodice. It was usually worn by women rather than girls, especially when they were pregnant so the laces of the bodice could be expanded. Fillet: Worn like a headband to make sure all your hair is tucked neatly under the coif, which is worn over it. Coif: The everyday head covering. for everyone, male and female, indoors and outdoors. They were worn on their own, but could also be worn with a hat as well. Apron: always worn when working. Overcoat: there is no evidence for ordinary women having coats specifically made for them. It was probably a unisex item in a household, worn by either men or women, as necessary. A complete man’s outfit consists of a linen shirt; doublet or jerkin; upper or trunk hose; nether or cut hose; hand-made leather shoes; knitted or felted cap. Shirt: The item worn next to your skin, it would have been made of linen. Upper (trunk) hose: also known as breeches. The breeching of a young boy, around the age of 7 was a landmark in his childhood, marking his move into the man’s world. Until then, a boy would wear skirts, just like his sisters. Nether hose or stockings would be worn under them. Early woollen (material) hose were fitted to the leg and had feet (like modern tights) and were open from the crotch to the leg. The nether hose were attached to the trunk hose with laces. Doublet: A doublet is a man’s snug-fitting jacket fastened with laces or (for the wealthier) buttons. The doublet developed from the padded garments worn under armour during the Middle Ages. Hat: although this style of hat dates from much earlier, it came to be known as a statute cap after a statute was passed in 1571 under Elizabeth I which made wearing this cap compulsory for ordinary men (the aim was to encourage the wool workers) It would usually be worn over the coif.